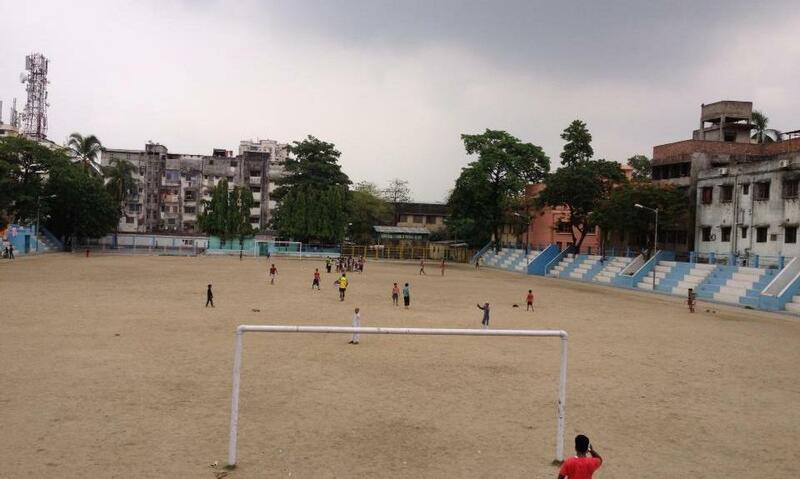 Khelo coaching today at Nawab Ali Park, and this time we travelled in Khelo’s newest member of the team, RAF Spitfires donated Maruti Ecco, no air conditioning though so it was a bit warm. As usual when heading through the busy Kolkata traffic the sound of a thousand horns was overwhelming but appropriate perhaps as a welcome to the Nawab’s Playground. We passed landmark after landmark, with Victoria Memorial first then The Taj Bengal and after that Alipore Zoo. I couldn’t help but notice that we were following a skip lorry for the majority of the journey, and couldn’t help but think back to the previous day’s sights of the Howrah Dhapa and thought to myself, oh no, not another rubbish dump. When we turned right and the lorry carried on straight a feeling of relief came over me. Nanda said that we were close to the park, but all I could see were tall buildings, surely there’s no ‘maidan’ here I thought, I couldn’t have been more wrong. We got out of the van and walked towards what looked like an empty space between high-rise buildings. There it was a small stadium, and as we entered the stadium we could see a bright green Khelo Rugby t-shirt, enter our very own Sarfaraz ‘Tiger’ Ahmed. Already he was surrounded by lots of rugby hungry children wanting to get hold of the rugby ball in his hand. Tiger kicked of his Khelo, getting the children warmed up with some games then he moved onto a lateral passing drill. But they didn’t need much warming up in this temperature which was by now reaching 38 degrees. There was very little shade in the stadium, apart from the few ‘Kadam’ trees that were overhanging the top of the seating areas. Warm up over and Tiger divided the kids into two groups to play a game of tag rugby. To save any arguments, he gathered the two captains and tossed a coin for who was going to start with the ball. The pink team won the toss and the game was off. As the pitch was bigger than at Howrah there seemed to be way more tries being scored. And what looked like Jason Robinson side steps were very professionally adapted to the dusty surface of the stadium. As Tiger shouted last try the intensity of the game went up a gear, as neither team wanted to lose. In the end a darting run by a blue going past player after player, side stepping and jinking won the game. Party time for the blues! After the practice had finished myself, Nanda and Tiger sat down under one of the kadam trees with a cold bottle of my favourite Calcutta soft drink, Mango Slice. We all said “lets go” at least twice but as it was so hot none of us moved an inch. Tiger was the first to move as he was off to his next Khelo practice, these coaches deserve more than a cold Mango Slice, they need a medal! This is what’s called a Streak of Tigers! We don’t normally get to go to Khelo practice in an air-conditioned Mahindra Scorpio, so this was a cool experience compared with the burning rubbish we were about to come across. We had an easy drive to the location listening to Hindi songs and chatting about the days events. But as Howrah Dhapa came into view, two guys who have lived in Kolkata all their lives could not believe what was in front of them. One described the sight as resembling a post apocalypse movie set, the amount of rubbish was unthinkable. 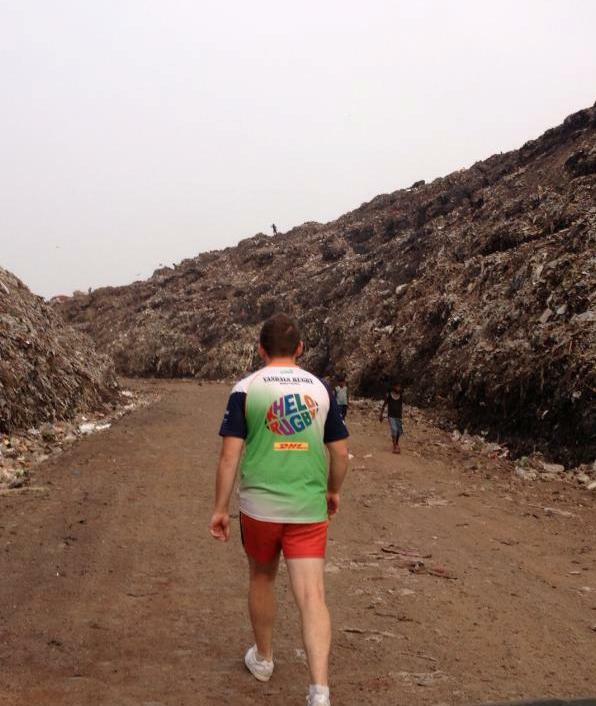 As we ascended up ‘mount Everest’ all you could see were mountains of rubbish, with what looked like millions of pigs, literally a ‘pigs sty’. We eventually came to a halt. As the car engine was turned off the AC slowly became thinner and thinner. We all opened the door without hesitation; the smell hit us like a brick wall. It was horrendous the smell of pigs bathing in rubbish and toxic waste doesn’t need to be explained further. We started to round-up the children and all that was surrounding us and the thoughts of our arrival were quickly forgotten. 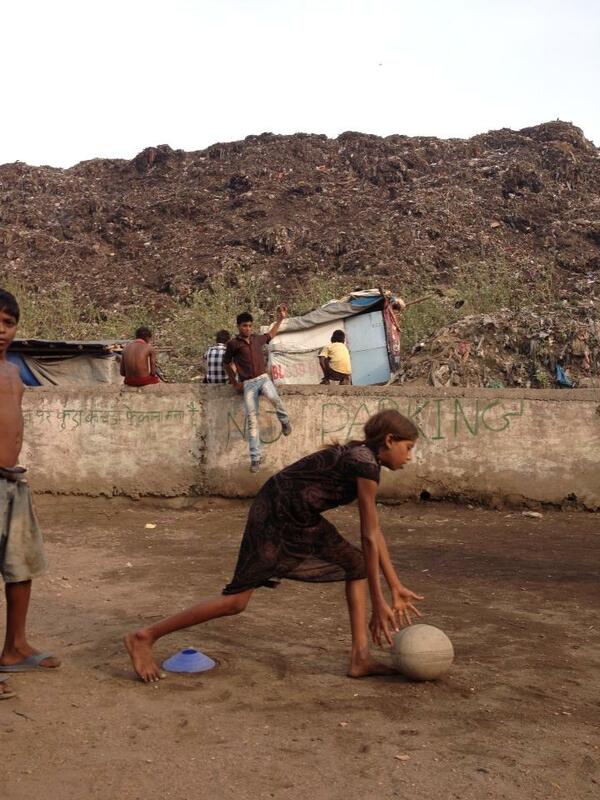 The children made this rubbish dump their home, their playground. 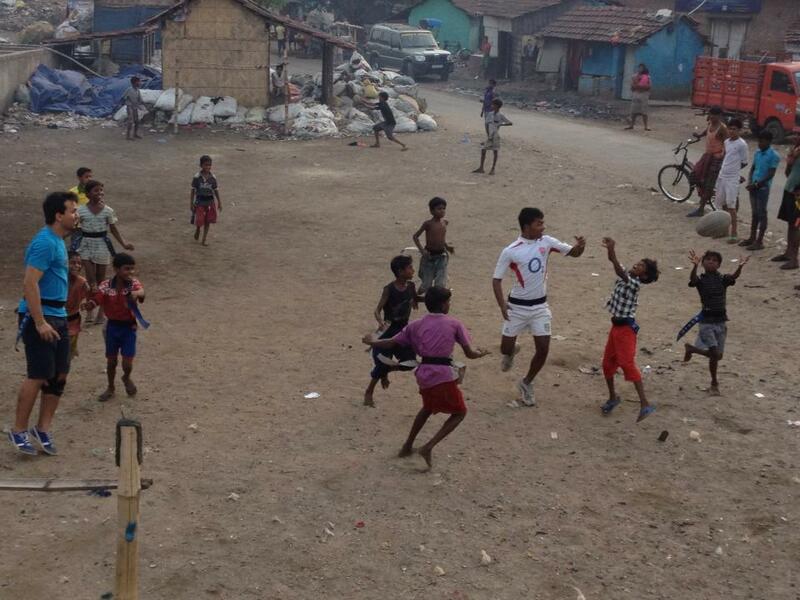 As we searched around the community, we came across the Khelo kids playing a game called ‘Pittu’. This game consists of 6 small pieces of brick piled up on top of each other, one person has a small football and has to knock over the pieces of bricks and put them back on top of each other, without another person retrieving the ball and hitting that person. They were making the most of their surroundings to say the least. No Play Station or X-Box was insight, but these kids were happier than any child I have seen in England. We took to the pitch which is no bigger than my back yard at home,with more glass in sight than there was grass. No Nike or Adidas was to be seen, just the bare feet of 20 boys and girls. We started practice with a warm up drill where the kid’s line up opposite each other, they have to pick up the ball and then run and put the ball down in front of the opposite line. In the process they have to say ball up and ball down, helps in getting them talking which is important for the game. After we finished warming up the children we split them into two teams and played tag rugby. 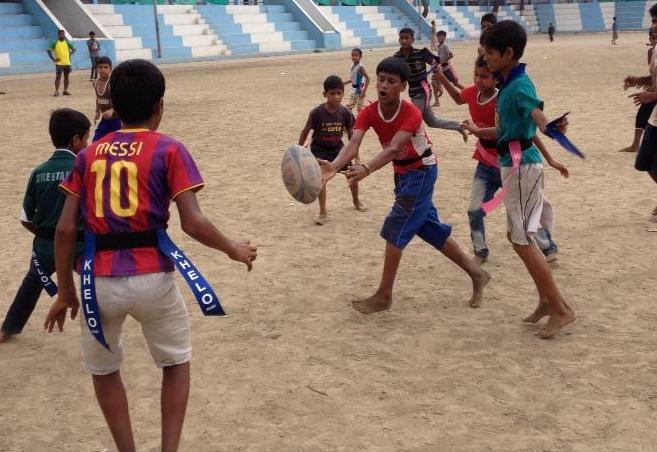 These children who have been playing rugby for just over one year looked like they had been brought up with a rugby ball in their hands. 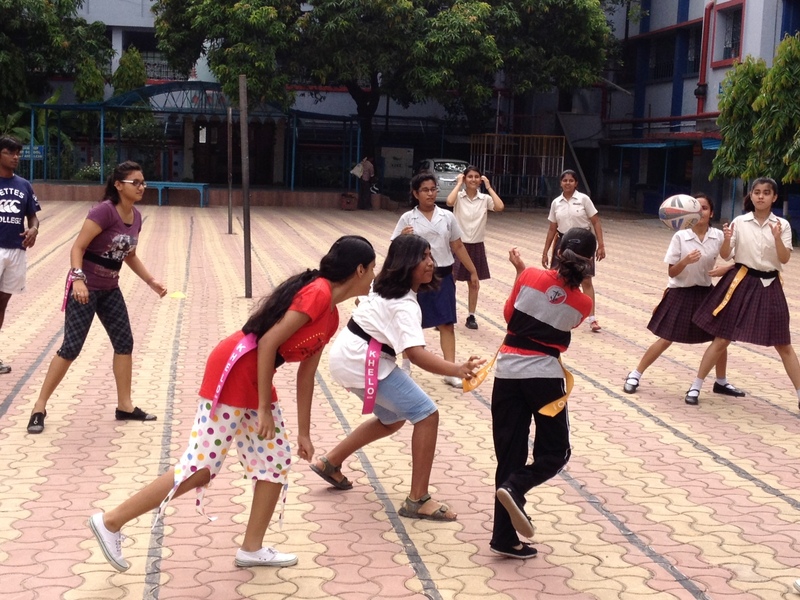 The match was dominated by calls of ‘ball’ ‘pass’ ‘tag’ which from a coaches point of view is a dream come true. Spectators started to appear, with facial expressions never seen to man. These children, who some barely looked old enough to run, were running at a hares pace with the rugby ball scoring try after try. In the end the match referee and Khelo Coach Nanda lost count of the score and the result ended up in a tie, which was a perfect out come as neither team deserved to lose. All tied in the end, just the right result! As the practice ended I decided to get the spectators involved and get them doing some passing and catching, with this odd-shaped ball which caused so much confusion. 30 seconds into the passing the expressions of confusion turned to broad grins of excitement, enough that would bring a smile to anyone’s face. The practice was over and back into the AC Scorpio, which we had all forgotten about. Instead of the conversation being of nice cars, nice clothes etc. It was about how happy we were to have played rugby with these children and how happy they were to have us playing and learning with them and enjoying and sharing the amazing game of rugby! 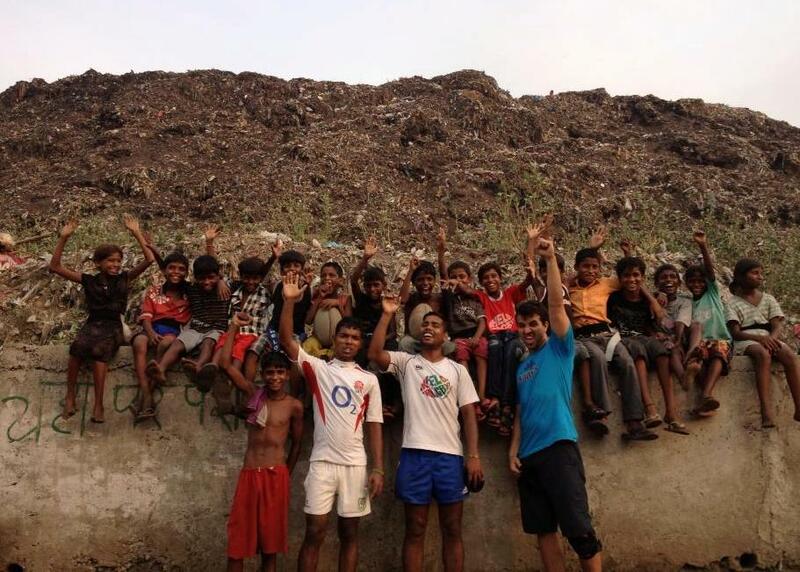 Sanu, Nanda and Zaffar with the Khelo Kids Howrah! KheloKhelo: So tell us Coach Tiger, you had a tournament Sunday, how was that? Tiger: Good…great…all the boys and girls were smiling after the tournament which was great for us. KheloKhelo: Don’t be shy Coach, tell us how many teams played and how many were coached by you? Tiger: Eight teams played and I normally take the coaching of two of them Nawab Ali Park and Hyde Road, but also coach some of the other teams at times. KheloKhelo: And how did your teams get on? Tiger: One team playing very good – Hyde Road because they do very good practice and do lots of hard work in their practice no joking around. Nawab Ali joke around too much and don’t get chance to practice so much, only on a Sunday but they played well. KheloKhelo: Which team won and who was there Coach? Tiger: Salt Lake Dhapa who are coached by Ajay and Nanda. They playing very well and 2-3 boys are very fast and have good sense how to play tag match. And they never give up always playing playing that’s why they won. KheloKhelo: So there was a theme on Sunday – Soap – tell us more about that? Tiger: Using Soap to wash hands before eating, after toilet and after any practice cricket, football anything is good. Before eating specially important because so many germs get on your hands and soap is good for cleaning up. We gave every child a bar of soap at the end which they can use at home. KheloKhelo: The tournament was special for another reason can you tell us more about that? Tiger: Emma’s Cup. Emma doing so many things for kids and especially Jungle Crows kids, she is very good. Emma loves all the kids and she is going away from India so we wanted to say thank you. KheloKhelo: Tiger, we also want to mention that you are one of the top players in Calcutta, what are your own rugby ambitions? Tiger: First is Jungle Crows, they make me as a good rugby player and give me so many supports so everything for me is Jungle Crows they gave me the opportunity. So first is to win and play Jungle Crows. I would also like to play abroad but I have problems with my birth certificate which we lost in floods so taking time to get my passport. I have played for India which was great but won’t be able to play this June in Asian 5 Nations as their games are abroad. 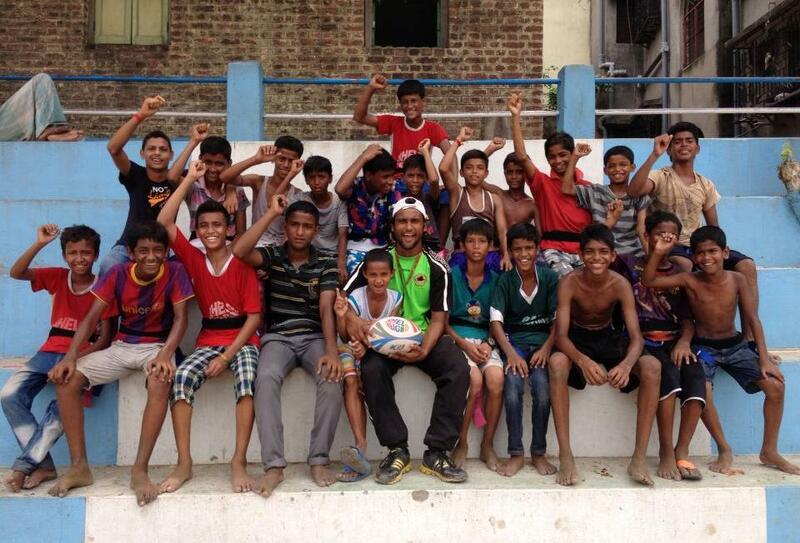 KheloKhelo: So finally Tiger you have any message for the small kids playing and taking up rugby? 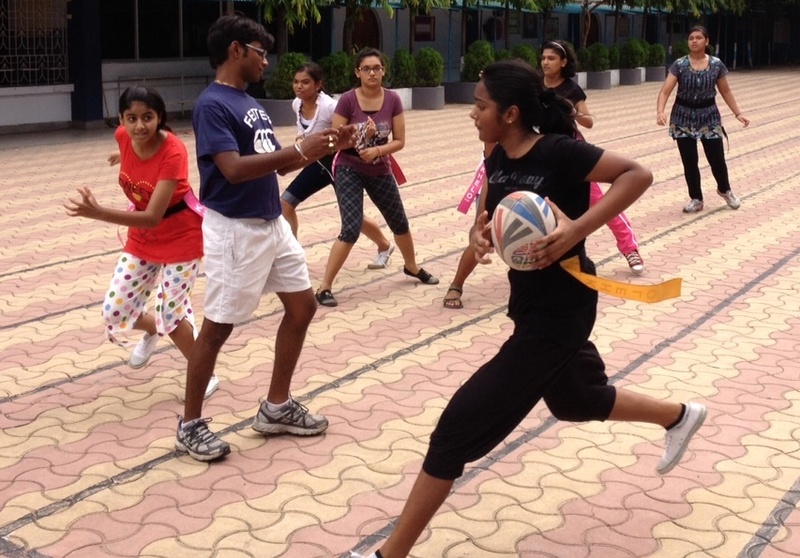 Tiger: Keep playing tag rugby when little and then as they get older come to the Jungle Crows Academy. The Academy is good to encourage the players. Play hard but fair always, remember rugby is team game and you all have to play together.